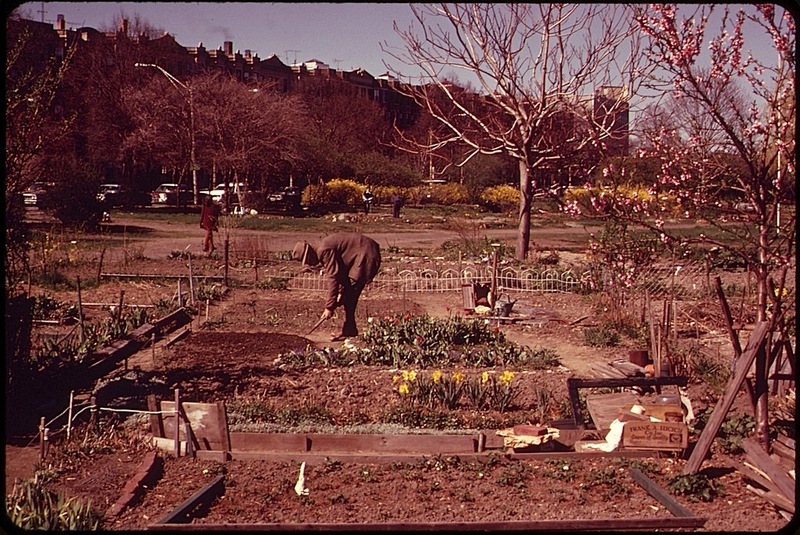 “‘City farmer’ tends garden in the Fenway, administered by the 600-member Fenway Civic Association. Four hundred twenty-five personal gardens are tilled on these five acres in Metropolitan Boston, [Massachusetts],” May 1973, by Ernst Halberstadt, via U.S. National Archives Commons on flickr. This photo was taken for DOCUMERICA, an early photography program of the U.S. Environmental Protection Agency (EPA). From 1972 to 1977, the EPA hired over 100 photographers to “document subjects of environmental concern.” They created an archive of about 20,000 images. In addition to recording damage to the nation’s landscapes, the project captured “the era’s trends, fashions, problems, and achievements,” according to the Archives, which held an exhibit of the photos, “Searching for the Seventies,” in 2013.